Attorney Justin Nelson is entering the race to be the state's top lawyer with just over a month until the candidate filing deadline for the 2018 primaries. "Justice is for all. Nobody is above the law," Nelson said in a news release. "Texans can do better than our indicted Attorney General who is charged with criminal fraud." Nelson, 42, is a partner specializing in major civil litigation at the Houston law firm Susman Godfrey LLP and has been named a Texas Super Lawyer by Thomson Reuters. A graduate of Yale University and Columbia Law School, he clerked for former U.S. Supreme Court Justice Sandra Day O'Connor and for Harvie Wilkinson, a judge on the U.S. Court of Appeals for the 4th Circuit. Paxton's campaign declined to comment on Nelson's candidacy. Nelson is joining the race as Democrats scramble to fill out their statewide ticket with serious contenders, most notably for the gubernatorial contest. The candidate filing period begins Saturday and concludes a month later. Upon Nelson's announcement, another Democrat who had been mulling a run for attorney general, Lubbock attorney John Gibson, threw his support to Nelson. "I am honored by the outpouring of support I have received but I have decided that Justin and I are so similar in vision that it makes no sense for both of us to run," Gibson said in a statement. "Justin Nelson is the best person to defeat Ken Paxton and restore integrity to the office of Attorney General." 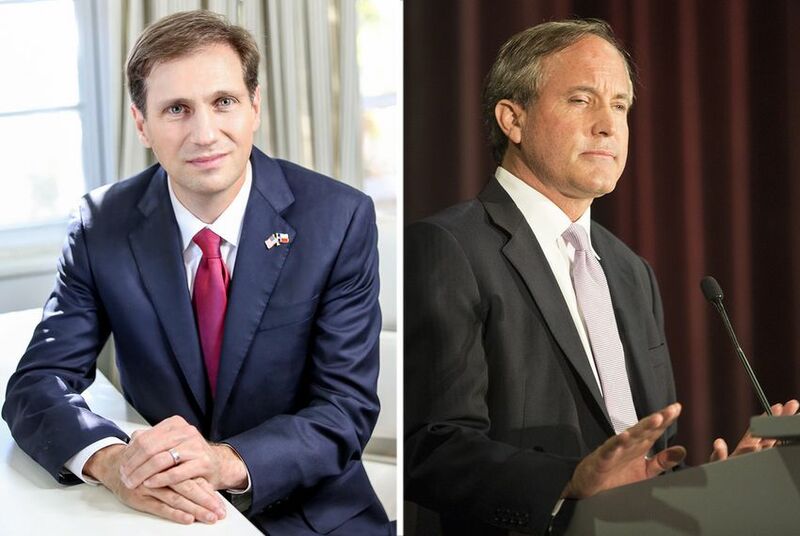 Nelson still may not be the only Democrat vying to challenge Paxton in March. Vincent Harding, the outgoing chairman of the Travis County Democratic Party, has said he is weighing a run as well. "I have known Justin for several years and wish him the best," Harding said in a statement after Nelson's announcement. "As previously mentioned, there are a few factors that will impact whether I accept requests to run for Attorney General. My interest in elected office is to help usher in a new kind of politics based on people and principle over power and money. I will make a decision on whether to run for AG by the first week in December, if not sooner." Paxton's legal saga is likely to continue well into the 2018 race. He is currently waiting for a new trial date in the state's long-running criminal case against him, which goes back over two years. The trial has been delayed three times, most recently due to the prosecutors' push to put it off until they can get paid. After prosecutors won the latest delay, Paxton's lawyers suggested rescheduling the trial for March.